It’s a scorcher today. What is going on with the weather? The temperature hit 100+ degrees in Orange County this weekend and today too. Once I got to work, I planned on staying inside until it cooled down when I to go home. I woke up bright and early this morning very excited for breakfast. 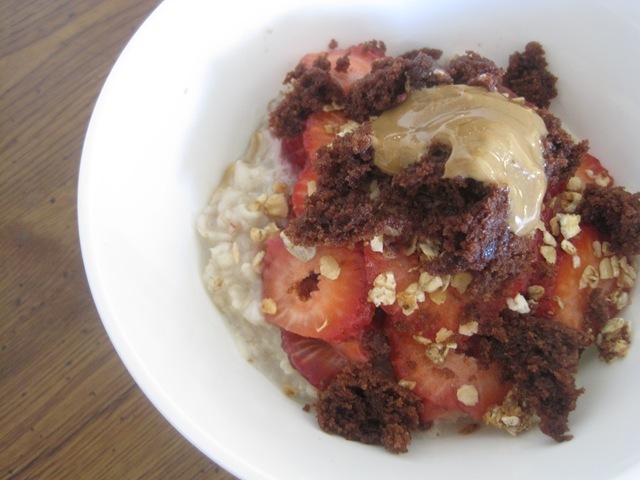 I saved one Chocolate Strawberry Shortcake Cupcake from the party this weekend and decided to use it as a topping to my oatmeal this morning. Did you know chocolate + sunbutter = heaven. 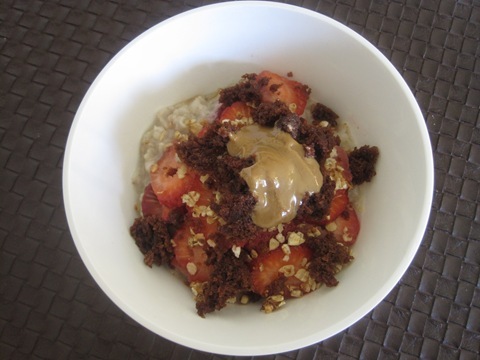 I crumbled half of chocolate cupcake on top of the oats, the icing was too sweet for me this morning so I excluded it. 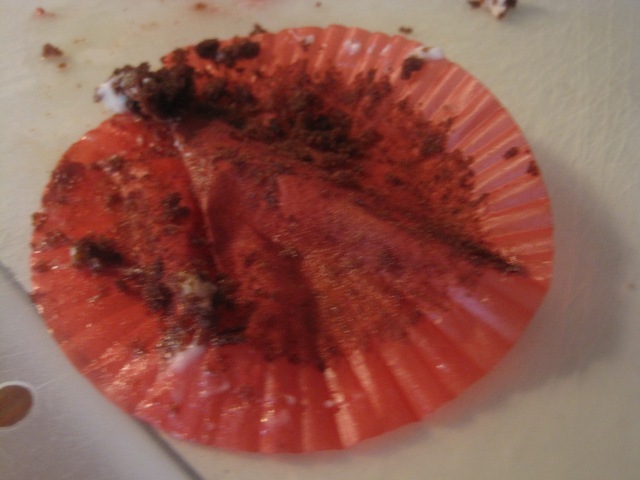 I scraped off the icing and left the other half of the cupcake on the kitchen counter and when I returned, this is what I found. The fiance does not like wasting any food and will eat any food sitting around for more than a minute, even if the owner is in the next room eating her breakfast. 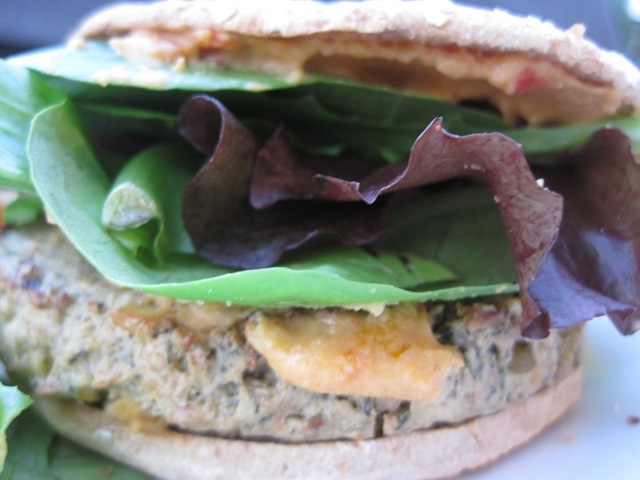 Lunch today was Sunshine Veggie Burger with Trader Joe’s roasted pepper hummus, lettuce, mustard and Earthgrain buns. 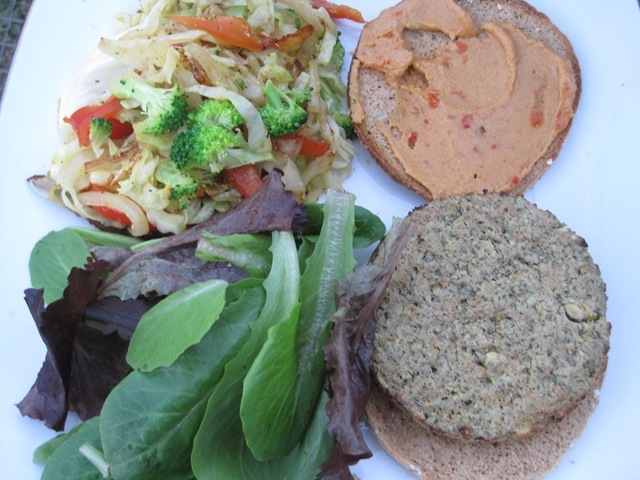 I stock up on Sunshine Veggie Burgers whenever they go on sale, it’s a healthy go-to quick meal when I don’t feel like cooking or it’s too hot to turn on the stove to cook or just too hot to be moving period. 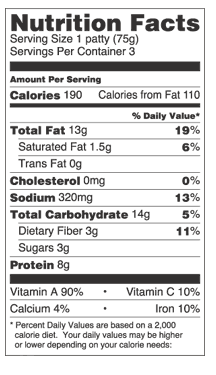 Ingredients for Sunshine Original Burger Flavor: Ground raw sun-flower seeds, Brown rice, Carrots, Herbs, Sea Salt. 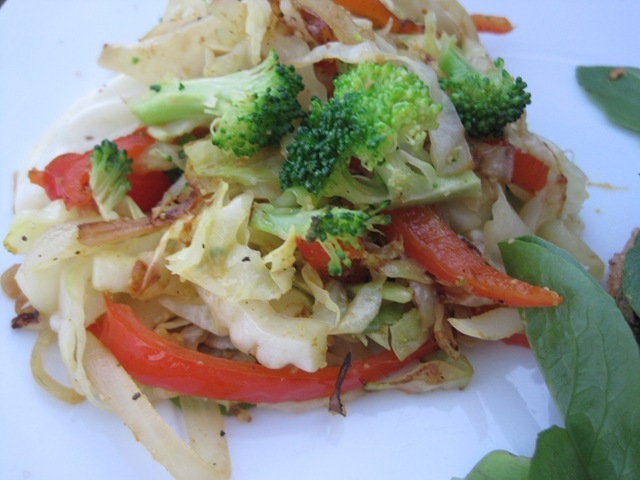 A side of cabbage stir fry. For late afternoon snacks, I prefer to snack on fresh fruits most of the time. 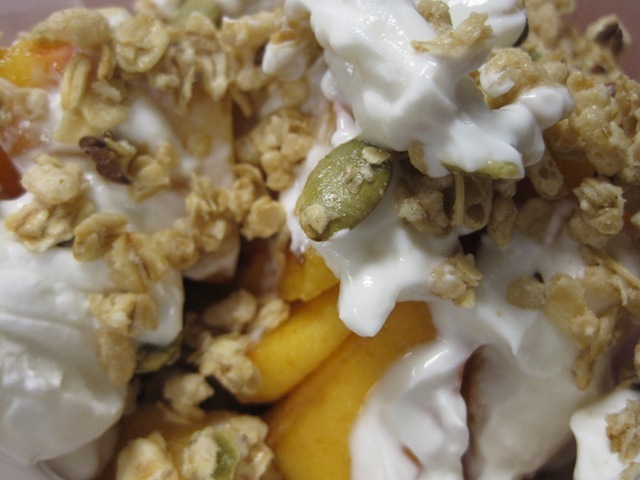 Today I ate fresh peach topped with greek yogurt and granola. I’m loving the crunch from the pumpkin seeds. 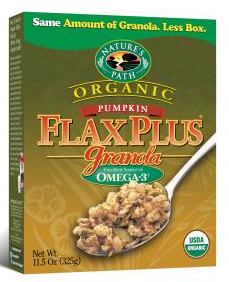 I bought Nature’s Path Pumpkin Flax Plus granola at Trader Joe’s and keep a box at work for my afternoon snacks. I often make my own granola because I find that the brands I buy at the store are too sweet for me. I use granolas as toppings on fruits to add crunch. I rarely eat granola on its own. 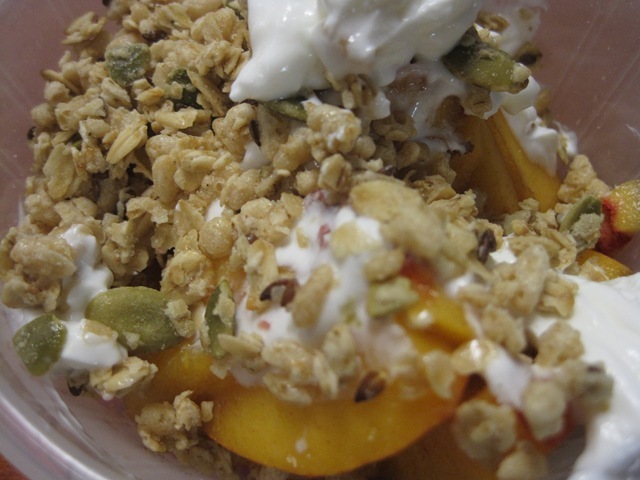 The bulk of my snack is the fresh fruit, but having the granola as toppings adds texture and crunch that I like. 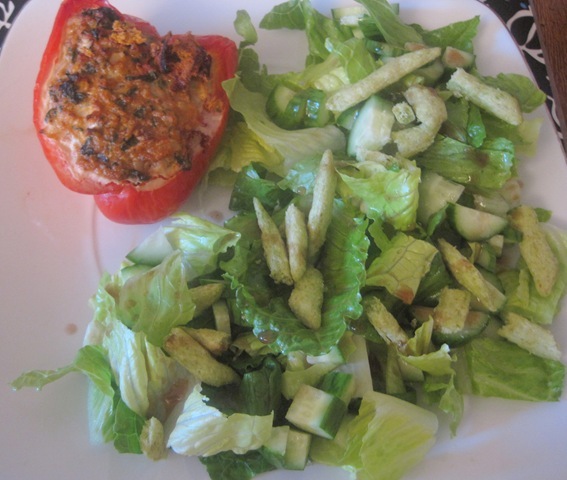 For dinner, I had Stuffed Bell Peppers and salad. Very simple salad but packed with flavors because of the Garlic Gold Meyer Lemon Vinaigrette. After trying this dressing, it has joined my list of favorite salad dressings. I am hooked. I recently open an online store with Open Sky. It will feature products that I personally use and recommend, including Garlic Gold products. Click on the Open Sky store link if you want to check it out. Hope you are having a great start to your week! P.S. Check out Alyssa’s Food Should Taste good giveaway for a chance to win healthy bag of chips. Yay for fellow Orange County bloggers 🙂 Nice finding you! Hi squigglefloey, thanks for checking out my blog. How cute is your name, I love it! Thanks for commenting so I can find your blog too. Yay for local bloggers. I’m always around UCI, shopping at Trader Joe’s and eating at Veggie Grill. Hi Kelsey. Thanks for stopping by my blog 🙂 It’s not my normal oatmeal topping but today’s cupcake topping was pretty yummy. I’m all about crunch in my food too. I’ve purchased that granola at Cost Co it’s delicious but ants got to it last summer and haven’t ordered any since. I buy a big bag I mean it’s huge don’t know exactly the pounds I’m guessing about 6-7lbs. but Jamba will sell you that bag for $10.00 I place them in sandwich baggies to store them. I think that might be the cheapest. Just an Fyi and love your sight by the way. Thanks for the tip and thank you for reading my blog. I’m sorry about the ants ruining the food. I agree, I love the bargain at Trader Joe’s. If I have 6lbs of granola, it might become my everyday obsession. I’m dying to try that Garlic Gold dressing! It sounds really tasty! I’m hoping my Whole Foods starts carrying it soon, since I’ve seen Garlic Gold products popping up all over the shelves lately! You are too sweet about the PB balls 🙂 For a pre show treat I always get PB and honey. Mmmm…pb balls LOL! 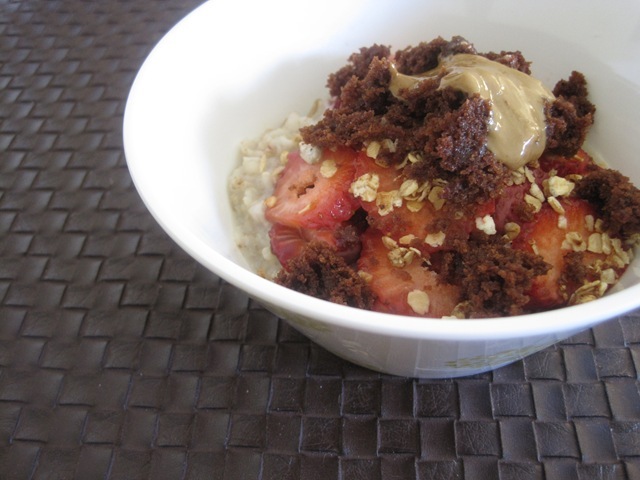 I never even thought to add cupcakes to my oatmeal what a great idea. Lea, are the sunshine burgers GF? Seems they have GF ingredients! How exciting! 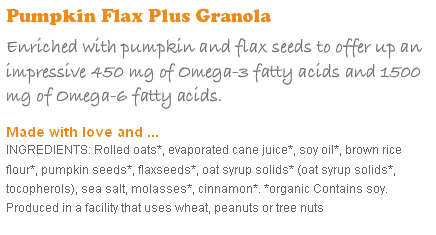 I used to love that pumpkin flax seed granola (COSTCO!!! ), but I decided I should really only eat things that said GF, so I took it out of my diet. It was like a dessert! So good to nibble on! Alyssa, from their website it states that “Sunshine Burger makes certifed organic gluten-free, soy-free vegan burgers with sunflower kernels and brown rice”. I didn’t even know that…but I like their products because they use real food ingredients. I follow the instructions on preparation but leave it in a little longer so that burgers get a little toasted and crisp on the edge. TJs never disappoints does it? How come everyone else is having heat waves but it’s only getting colder here?hmph. Heat wave is right! Dear lord is scorching! And Tj’s= love! Been really hot here too lately but the yesterday was 75 and sunny. A rare treat! Great idea with your breakfast to use the cupcake. My family would love this. Hi There, I am putting together an LA HLB bloggies meet-up for a 1:00 p.m. lunch on Saturday, October 23. If you are interested in joining us please email me at yellowbrickbeauty@gmail.com and let me know. It’s hard finding bloggers in my area, so I have to branch out. There aren’t as many Canadian bloggers as American ones as far as I know.